“Oh give me land, lots of land, under starry skies above…don’t fence me in” – ha, rehashing an old cowboy song is timely, as I complete an evaluation of the Open Range Internet services. Instead of conveying the feeling of wide open spaces and freedom, I definitely felt fenced in when using the service. If you haven’t heard Open Range is a WiMAX Internet Service Provider, that’s been serving the South Bend area since November 1st. I signed up for the 30 day free evaluation, to test the service and get my second real world experience with WiMAX (the first was in Uganda last year). The service runs something like $38/mo (Internet & Wifi only) and $54something-or-other (Internet/Wifi/Phone)…details are on their website. I actually found out about Open Range when they sponsored a Scholastic Book Fair at my daughters school and provided free Jimmy Johns subs. 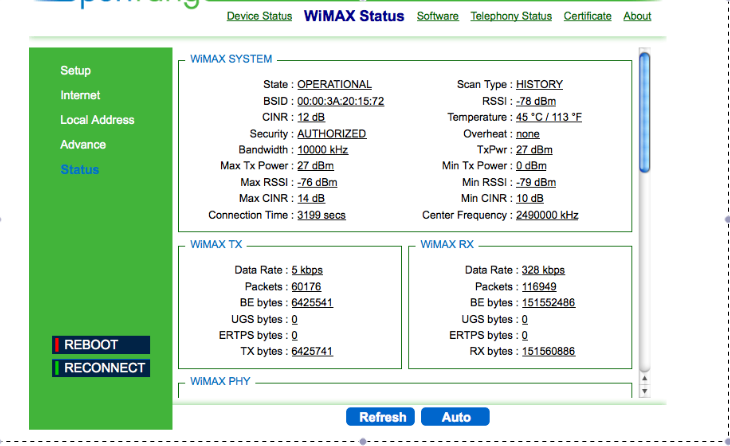 On November 29th, I stopped by the office, located across from Nick’s Patio, to pick up the WiMAX CPE. The sales guy offered to stop by and install the device, but I insisted on doing the self install to see how easy/difficult it was to install. The installation took all of 2 minutes and was as easy as plugging it in, then joining the Wifi and adding the WPA key. Since the CPE device is an all in one WiMAX receiver, router, and Wifi access point, it provides a nice option if you want to avoid the tangle that can become a home network…like mine. The device was rather interesting looking, blue LEDs on the front to indicate WiMAX signal strength and Wifi, as well as some large “paddle” antennae that fold up and down. Note, beware of the little sensor between the antennas, if it’s covered the CPE (customer premise equipment) shuts down. The rear of the box (sorry, no picture), has a couple of LAN ports to integrate this into your home network, also has a couple of POTS ports for voice service. BTW, I only evaluated the Internet, didn’t try the voice…mainly because I didn’t want to screw with porting my home phone. That’s another issue altogether. So, over the course of the three weeks I had the service up and running, I conducted a number of speed tests and much to my disappointment, I was averaging about 680kbps downstream and 369kbps upstream. According to Open Range customer service, the advertised speeds are 3Mbps down/1Mbps up…of course your mileage may vary…but my speeds were WAY off. A full breakdown of my speed tests, through multiple sites, is below. Latency tests, were all over the map. My final test, even though I was sure I’d have problems, was Netflix streaming through my Wii Console. First of all the download of a film “The Big Chill”, took about 7-8 minutes. When I use my primary ISP (Comcast) a Netflix download takes about 20-30 seconds. During the film, about every 15-20 minutes, the “retrieving” message would come up while the video buffered to catch up, usually for about 5 minutes. Finally, I did speak with a very nice lady in customer service last night, went through all the required scripts and troubleshooting, but to no avail. The WiMAX signal levels I was getting were fine and I was not in one of the identified “network capacity” areas in South Bend. Due to their fast growth it sounds like certain areas have backhaul oversubscription issues. In conclusion, if you’re still in the world of dial up, the Open Range service makes great sense, if you’re in their coverage area. If you’re looking for something simple to install and support, once again, this is a slam dunk. If you’re looking at shear bandwidth throughput, you may want to consider another provider. I have to say, it is nice to see additional competition in the South Bend market for Internet services. Would love to see them launch services in the Upper Peninsula and other rural areas to reduce digital divide. If you’ve had a better experience with the Open Range service, I’d love to hear from you. 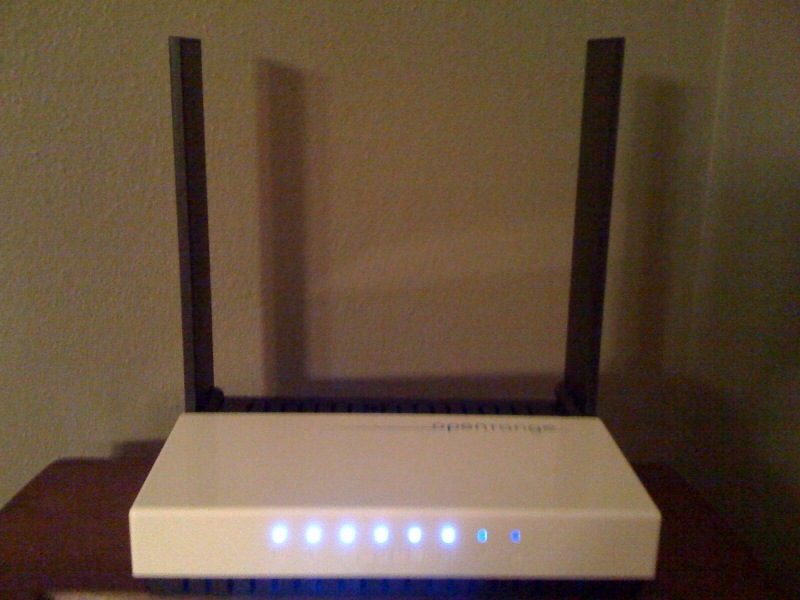 the OpenRange Internet Service. I tried it out and it took at least a week for them to get me up and running after installing the device in Columbia City. I attended an open house where I took my laptop and tried downloading some hour tv programs and it was slow – on the average of 15-20 minutes at a rate of 75kbps. As I waited for the service to beging working at home I discovered that I could connect free from someone with lynskys in the area and it was operating about three times faster so download of the same tv program took about five minutes at about 200kbps. I ran several ping speed tests with speedtest.net and it was never any better so I quit. However being legally blind and unable to read the contract and having moved I was remiss to return the router and about a month after termination my debit account was minus $200 for the router that the contract (if you read it) states this is a cost that is full market value for a router that the government owns. Peculiar to say the least. I am trying to return the router now and get OpenRange to also refund $32 for overdraft charges I incurred on my very meager budget. I do not even remember being provided a copy of the contract. Can someome help me determine the true value of this device? The one I have says nothing at all about the name of manufacturer and only has a model no. 4M-CPE4000-Si-2D-2V-WiFi-2.5 and my searches with google and bing have fruitless except for your article and experience you related here. Hi there and sorry about the late response. The amount on the router is probably correct, as these CPE devices usually run about $150-$200. Assuming you eventually returned the router, have you tried appealing this decision to Open Range customer service? I’d be curious to know that they say.